Roel van Duijn and Luud Schimmelpennink started painting three black bicycles white. “The white bicycle is the first free communal transport,” as their flyer put it. Once so transfigured, the bikes would simply be left on the streets; to make them free for all to use, the flyer said, “the white bicycle is never locked.” And that, it turned out, was a problem. After they were let loose on the streets, the white bikes were impounded by the police. A 1928 statute, they pointed out, required bikes to have locks. Ownership was not optional. Still, some in the Netherlands still dream of making bikes ever more free—creating a system in which bikes are not owned by people, or cities, or by companies using them as data-sources, but by themselves. Marcel Schouwenaar, a Dutch designer, has a plan called Fairbike which gives bikes blockchains. Blockchains, the software innovation that makes cryptocurrencies possible, are distributed ledgers which keep untamperable records of actions and transactions. Mr Schouwenaar thinks that the “smart contracts” blockchains allow—agreements that can monitor the fulfilment or breach of any conditions they stipulate—could create self-managing fleets of bikes. Using Fairbike would be like using Mobike. But instead of passing on your money to a central organisation, the bikes would hold on to it. 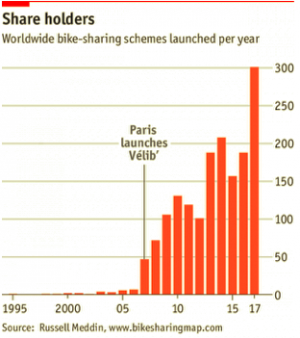 Once a community set such a system up it would pay for its own maintenance—and, when enough funds had been collected, new bikes. Systems used a lot could thus both heal their wear and tear and increase their population. The repair jobs and new bike orders would be assigned on a lottery basis to registered bike shops. Theft would finally become impossible, at least technically; wherever a Fairbike was taken it would still own itself. There would, however, be a certain loss of access.